The book that cracks the code, from the incomparable Patricia Wells. An acclaimed authority on French cuisine, Ms. Wells has spent more than 30 years in Paris, many as former restaurant critic for The International Herald Tribune. 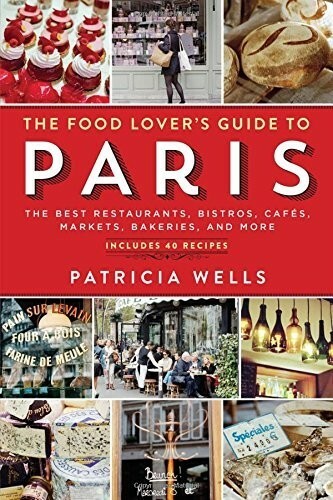 Now her revered Food Lover s Guide to Paris is back in a completely revised, brand-new edition. In 457 entries 345 new to this edition, plus 112 revisited and reviewed classics The Food Lover s Guide to Paris offers an elegantly written go-to guide to the very best restaurants, cafes, wine bars, and bistros in Paris, as well as where to find the flakiest croissants, earthiest charcuteries, sublimest cheese, most ethereal macarons, and impeccable outdoor markets. The genius of the book is Ms. Wells s meritocratic spirit. Whether you re looking for a before-you-die Michelin three-star experience (Guy Savoy, perhaps, or Restaurant Alain Ducasse au Plaza Athenee) or wanting to sample the new bistronomy (Bistrot Paul Bert, Le Comptoir du Relais) or craving something simple and perfect (L As du Fallafel, or Breizh Cafe for crepes), Patricia Wells tells you exactly where to go and why you should go there. You no longer have to rely on the iffy reviews of Yelp or Trip Advisor. Included are 40 recipes from some of her favorite chefs and purveyors and, of course, all the practical information: addresses, websites, email, hours, closest metro stop, specialties, and more.